Sequels are never easy. They have to continue where the last film left off and add something new to the mix so they don’t feel stale. Frequently this involves writing out the previous love interest in order to make room for someone new or because the screenwriters just don’t know what else to do with them. In this list I’ll only talk about instances of an established character in the first film who is briefly mentioned or makes a short appearance in the sequel. So no Bond films will appear on this list because none of James Bond’s former lovers get a farewell at the start of a sequel. And no, I don’t count For Your Eyes Only because she was already killed at the end of On Her Majesty’s Secret Service. With that said, here are 10 unceremonious ways sequels dump their preceding film’s love interest. I don’t find much to enjoy in Batman Returns. To me, it’s just as cartoony as Joel Schumacher’s Batman and Robin. The only difference is that it has some of that early Tim Burton gore, which makes it even more off-putting. But it has the distinction of being the only film in its series to at least mention Bruce Wayne/Batman’s previous girlfriend by name. After learning that Bruce Wayne is Batman and taking a tour of the Batcave, she just decides he’s not right for her and splits. And we only learn this after the fact when Bruce talks to Alfred about it. That kind of makes her character even shallower than she was in the original Batman. Remember the guy who was kind of important to Mia and wound up kissing her at the end of the first Princess Diaries film? He’s written out of the sequel with a throwaway line about how they’re just long-distance friends now. He never even shows up in the film. I’m not a fan of most romantic comedies, and I was already on the fence about watching this sequel. So when they tossed aside any emotional connection I might have made to the first film, I knew I was done with it. Carol Marcus plays an essential role in Star Trek II: The Wrath of Khan. She invents the Genesis torpedo and explains what it is in a video. 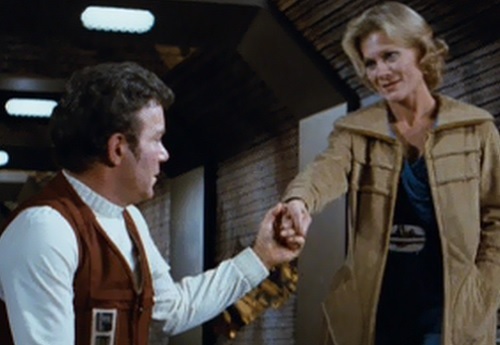 And she even shares a few tender scenes with her old flame Captain James T. Kirk. Beam over to the next film in the series Star Trek III: The Search for Spock and inexplicably it’s now her son who made the Genesis torpedo and Kirk who recorded the instructional video about it. Wait, what? Did I miss something? Saavik blames David for major flaws in the Genesis planet, but shouldn’t she be placing the blame on his mother? He was just an assistant while she seemed to be the brains behind the operation. Oh well. Nobody’s perfect. I like The Karate Kid Part II, but it really shortchanged Daniel LaRusso’s girlfriend from the first film. Ali was a sweet girl who Daniel can’t help falling in love with thanks to her charm and wit. But you’d never know it from the start of the second film. Out of nowhere, Ali crashes Daniel’s car and throws him into a fit of frustration. He can’t wait to leave the country and move on to more exotic lovers. They had to quickly explain Ali’s absence from the film and free Daniel up to have an admittedly excellent romance while on his trip to East Asia. But I wish Ali could have bowed out with a little more dignity. Elizabeth Shue shows up on this list again. Okay, so Marty McFly never dumped Jennifer Parker in Back to the Future Part II, but the screenwriters certainly did. Robert Zemeckis and Bob Gale famously racked their brains over what to do with Jennifer after Doc brought her and Marty to the future at the end of the first Back to the Future film. Out of desperation, they decided to just keep knocking her out so she wouldn’t burden the story too much with her presence. She does have an important part to play in the third film when a message she took from the future gets erased in the present to show that her future isn’t written. But as far as Back to the Future Part II is concerned, she’s just excess baggage. I get the feeling that Mike Myers had no idea what he was doing when he was crafting the Austin Powers films. Sure, each one is hilarious, but they’re utterly inconsistent with each other, and not in a funny way where that’s part of the joke, but in a way that they feel really inept, like having No. 2 turn on Dr. Evil and then reverse course, making Austin Powers and Dr. Evil brothers – and making Austin’s wife a fembot. The first film showed Vanessa Kensington talking to her mother, getting drunk, and doing other things that made it seem like she’s a normal human being. So it was completely unbelievable when The Spy Who Shagged Me suddenly transformed her into an evil fembot bent on killing Austin. Thankfully, Goldmember had the good sense to pull a typical James Bond trope and just not even mention Austin’s former girlfriend. The first Die Hard film features John McClane not only fending off terrorists who threaten to kill him and everyone else in an L.A. high-rise, but also patching up his marriage to his estranged wife in the process. Then in Die Hard 2 he spurns the advances of several beautiful women who offer sexual favors to him. “Just the fax, ma’am.” He’s a happily married man, and they better not forget it. So then why does he wind up a divorced alcoholic with a black “buddy cop” partner in Die Hard with a Vengeance? Probably because the script was originally supposed to be a Lethal Weapon sequel. All of this would make sense for those characters. But it’s definitely out of place for a Die Hard film. Die Hard with a Vengeance is still an awesome film despite that flaw. Killing a beloved character is a risky move. It can alienate fans of the previous film or it can be an effective way to distance the sequel from its predecessor and give the surviving characters an instant motivation to get revenge. In the cases of Alien3 and Mortal Kombat: Annihilation, it definitely backfired. Any hope of making a good film died with Corporal Hicks and Johnny Cage. They were the most likable survivors of their respective films, and their absence is felt in the worst way in the sequels. I personally would have loved to have seen William Gibson’s version of Alien3, which focused on the adventures of Hicks and Bishop. And there was just no saving Mortal Kombat: Annihilation. The Bourne Supremacy, on the other hand, managed to be a solid sequel despite killing off Marie early in the film. Her jarring death propelled Jason Bourne back into the world of espionage and made the audience immediately feel sympathetic for him once again. It’s pretty ironic that so many people connected to a guy named “Bourne” end up dead. Circle of life. RoboCop 2 begins very promisingly. It hits the ground running, introducing a lot of story threads. The most interesting one comes when Murphy starts to remember his wife and son. He has no idea how to reconnect with them, however. He’s legally dead and, as OCP executives point out, there’s not even enough of his body left to fill a coffin. So, in the film’s most gut-wrenching scene, Murphy must tell his wife that he’s only a machine designed to look like her husband. He pushes her away and she leaves in tears. And then the movie never returns to that emotional storyline to give Murphy some much-needed catharsis. If the Salkinds had wanted to make an amazing sequel to Superman II, all they had to do was let Lois Lane retain her memory that Clark Kent is Superman. The scenes between Lois and Clark would have been amazing. He wouldn’t have to hide from her anymore, and she could play the role of his bodyguard in many ways, throwing people off his trail and making excuses for him when he mysteriously disappears. They could even introduce a unique love triangle by bringing someone else into Clark’s life. Then Lois would be forced to rethink her decision not to be with the man she loves. But instead, Superman used a memory-wipe kiss on her and she made a speedy exit from Superman III by going on vacation. Any chances for this series to continue its greatness went up, up, and away in a puff of smoke. Okay, so Woody’s romance with Bo Peep wasn’t deeply explored by the first two Toy Story films, but it was obvious they were passionately in love with each other. But Toy Story 3 shockingly left her completely out, except for a brief prologue. Woody quietly mourns her loss after being reminded that Andy sold her years ago. This is kind of a kick in the stomach, but it served a good purpose, making Andy the sole focus of Woody’s love. At least they kept Jessie so Buzz Lightyear could engage in some epic dance moves. Not every love story has a happy ending. Sometimes a tragic romance can be fascinating to see unfold. But to start a sequel by throwing out all of the relationships the first film worked so hard to set up just feels like a betrayal or at least an anticlimax. Luckily, for every Anchorman 2, there’s an Empire Strikes Back, which finds new ways to deepen the established love story. Not all of the films above are terrible. Many of them managed to recover from the initial shock of losing a loved one and went on to tell great stories. I just like to know that the characters I’m rooting for have a satisfying end from one film to the next. This entry was posted in Random Stuff and tagged alien, austin powers, back to the future, batman, batman returns, comic books, die hard, die hard with a vengeance, films, jason bourne, karate kid, love, movie review, movies, princess diaries, robocop, romance, science fiction, sequels, star trek, superman, toy story. Bookmark the permalink. A more recent example I can think of is Ted 2. Such a lazy way to ditch Mila Kunis in favor of Amanda Seyfried. Interesting. I never saw the Ted movies. I got tired of Family Guy a long time ago, and I just have no desire to go back. Hahaha – love the take on Bond’s love interests, who are always murdered or just pumped and dumped! What’s your take on actress swapping, like Rachel in Batman Begins / Dark Knight? Thank you. It doesn’t bother me too much, as long as the replacement actor or actress is really good, like Don Cheadle in the Iron Man sequels. But they never should have done RoboCop 3 without Peter Weller… or a decent script, for that matter. If a character or actor is minor enough, it can work. But I’m glad films like Superman II and The Godfather Part III didn’t try to replace Brando or Duvall in small but essential roles when the actors refused to return.